Deryck Poole is a veteran of the United States Marine Corps and the founder and director of training for Echo-5 Training Group. He is also a senior Combat Focus Shooting instructor and works for I.C.E. Training as a staff instructor and outside instructor liaison. He holds certifications from I.C.E. Training and Glock Inc, plus multiple NRA instructor certifications. Deryck has been shooting his entire life and still owns the rifle he was taught to shoot with at eight years old. He has 17+ years of experience as an instructor. He conducted training for both combat and non-combat personnel while serving as a rifleman and range safety NCO in the Marines. 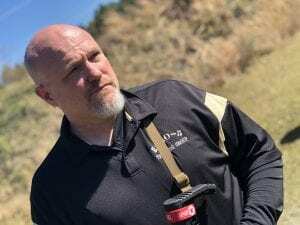 He continues to work with both armed professionals and lawfully armed citizens as a firearms and defensive shooting instructor. He believes all instructors should consider themselves a student first, so he regularly attends training from some of the world’s top instructors. He is a contributing author at the Personal Defense Network and is a charter member of the Association of Defensive Shooting Instructors.